This article is about the American football player. For the British property developer, see David Garrard (property developer). David Douglas Garrard (born February 14, 1978) is a former American football quarterback who played in the National Football League (NFL) for twelve seasons. He played college football for the East Carolina University Pirates. He was drafted by the Jacksonville Jaguars in the fourth round of the 2002 NFL Draft, and served as the team's starting quarterback from 2007 to 2010. Garrard was born in East Orange, New Jersey and grew up in Durham, North Carolina. When he was fourteen his mother died of breast cancer; when he began his professional career he created The David Garrard Foundation to promote breast cancer awareness and research. Garrard attended Southern High School in Durham, where he was named an All-America choice by Prep Stars and rated the best high school quarterback in North Carolina. Veteran high school coaches in North Carolina said Garrard possessed one of the strongest arms they had ever seen and compared Garrard to former NFL quarterback Roman Gabriel. Garrard attended East Carolina University, where he played for the East Carolina Pirates football team. Although physically larger than most quarterbacks at more than 240 pounds, Garrard displayed exceptional mobility. Former East Carolina head football coach Steve Logan compared the experience of tackling Garrard to "getting hit by a beer truck." Garrard also proved durable, starting every game for the Pirates in the 1999, 2000, and 2001 seasons. In Garrard's sophomore season, he led the Pirates to a 9–3 record with victories over the West Virginia Mountaineers, South Carolina Gamecocks, Miami Hurricanes, and North Carolina State Wolfpack. In the fourth game of the season against Miami, East Carolina came back from a 20–3 deficit to defeat the 13th-ranked Miami Hurricanes, 27–23. Garrard threw a 27-yard touchdown pass to Keith Stokes for the go-ahead score in the final minutes of the game. ECU was unable to play the scheduled home game at Dowdy–Ficklen Stadium on its campus in Greenville, NC, because Hurricane Floyd had ravaged the eastern part of the state the prior week. The hurricane also prevented the Pirates from returning to Greenville following a road victory against South Carolina, leaving ECU's football team stranded in Columbia, SC. East Carolina moved the game against Miami to Carter–Finley Stadium in Raleigh. The victory propelled ECU into the Associated Press college football poll's top 25. The Pirates spent eleven weeks ranked in the AP poll, climbed to as high as 16th in the poll, and finished the regular season ranked 20th. East Carolina dropped out of the top 25 to 27th in the voting after losing 28–14 in the Mobile Alabama Bowl to Texas Christian University and the Horned Frogs' star running back, LaDainian Tomlinson. ECU finished 8–4 in Garrard's junior season. Garrard capped the season by throwing an unbelievable touchdown and rushing for another acrobatic TD in a 40–27 victory against Texas Tech in the Galleryfurniture.com Bowl. Garrard's senior season began with high expectations but ended in disappointment. Although East Carolina averaged more than 35 points per game in 2001, the Pirates finished the season with a 6–6 record. Ironically, the final game of Garrard's college career pitted him against Marshall University and its starting quarterback, Byron Leftwich, in the 2001 GMAC Bowl. Garrard and Leftwich would eventually be teammates with the Jacksonville Jaguars and compete for the team's starting quarterback position. In the highest-scoring bowl game in college football history, Leftwich brought Marshall back from a thirty-point deficit to defeat Garrard's East Carolina Pirates 64–61 in double-overtime. Garrard broke 28 school passing and offensive records at East Carolina and joined a select few quarterbacks who achieved more than 9000 passing yards and 1000 rushing yards in their collegiate careers. Garrard went on to graduate from East Carolina University in 2001 with a degree in Construction Management. All values were taken from the NFL Scouting Combine and published in the NFL's scouting report. Garrard was drafted as the apparent successor to starting quarterback Mark Brunell. However, following the 2002 season, the Jaguars fired then head coach Tom Coughlin, and new general manager James Harris drafted Byron Leftwich with the seventh overall pick in the 2003 NFL Draft. Leftwich replaced an injured Mark Brunell as the starting quarterback during the 2003 season and Garrard continued to serve as the team's backup quarterback. Doctors diagnosed Garrard with Crohn's disease in 2004. Despite undergoing surgery in June 2004 to remove a nearly 12-inch portion of his intestines, Garrard played during the 2004 NFL season. Garrard started for the Jaguars' when Leftwich was injured during Week 9 of the 2004 National Football League season with a sprained left knee. After the 2004 season, Garrard opted to stay with the Jaguars as a back-up instead of pursuing a chance at starting for another team. Garrard also started 5 games of the 2005 season when Leftwich went down with an injury in week 11. With Garrard as starting quarterback, the Jaguars finished the regular season by going 4–1 and made the playoffs, with the only loss coming at the hands of the Indianapolis Colts. Leftwich then returned as the starter for the AFC wild card playoff game, in which the Jaguars suffered a 28–3 loss to the New England Patriots. 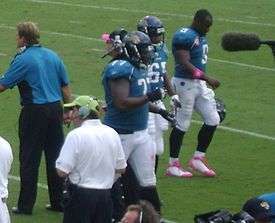 Garrard (far right, #9) with the Jaguars). In 2006, Del Rio named Garrard the starter in Week 8 and attributed the change to Leftwich's chronic injury problems, but Leftwich claimed he was healthy enough to continue serving as the team's starter. Garrard was inconsistent and went 5–5 to finish the season as the Jaguars missed the playoffs. In November 2006, Garrard was intercepted four times in a 13–10 loss at home against the Houston Texans. In February 2007, Del Rio attempted to avoid a quarterback controversy by naming Leftwich the team's unconditional starting quarterback. However, Garrard outplayed Leftwich in the 2007 preseason, throwing for 456 yards, one passing touchdown and another rushing touchdown. Del Rio said Garrard gave the Jaguars a better chance to win than Leftwich and announced Garrard would be the starting quarterback of the Jacksonville Jaguars on August 31, 2007. The Jaguars released Leftwich the next day. Garrard led the Jaguars to an 11–5 record and threw for 18 TDs and 2,509 yds despite missing 3 games with a sprained ankle. He also tied an NFL record by throwing only 3 interceptions, which gave him a quarterback rating of 102.2. On January 5, 2008, In the AFC Wild Card Game, Garrard led his team to a 31–29 victory over the Pittsburgh Steelers. Down 29–28 with 1:56 to go, he led his team in a field goal-scoring drive highlighted by a 32-yard run on 4th and 2 that eventually set up the game winning field goal for the Jaguars. On January 12, 2008, In the AFC Divisional Playoff Game, David threw for 278 yards with 2 touchdowns and 1 interception against the unbeaten New England Patriots. However, the Patriots won the game, 31–20. On April 7, 2008 it was announced that the Jaguars and Garrard had agreed to a contract extension, worth $60 million for 6 years. 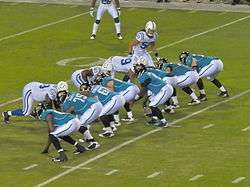 In 2008, the Jaguars slumped to a 5–11 record, with an injured offensive line. Garrard threw for 3,620 yards, 15 touchdowns, and 13 interceptions, giving him a quarterback rating of 81.7. The Jaguars missed the playoffs, and finished last in the AFC South. The 2009 and 2010 seasons saw the Jaguars finish 7-9 and 8-8 respectively, and narrowly miss the playoffs; Garrard's touchdown-to-interception number and quarterback rating would increase each year as well. Garrard concluded the 2010 season throwing for 23 touchdowns, 2,734 yards and a quarterback rating of 91. However, Jacksonville drafted Missouri quarterback Blaine Gabbert with their first round draft pick, though still insisting Garrard would remain the starter. Garrard, however was released by Jacksonville on September 6, 2011, less than a week before the start of the 2011 regular season. Garrard received interest from the Colts, Dolphins and Raiders, but decided to use his time off to have surgery on his herniated disk and prepare himself for the 2012 season. On March 19, 2012, Garrard agreed to terms with the Miami Dolphins on a one-year contract. Garrard noted in an interview with ESPN, he made his decision due to likability and responsibility with the Miami Dolphins. He entered training camp as the favorite to win the starting job. On August 10, 2012, Chris Mortensen of ESPN reported that Garrard would undergo arthroscopic surgery and miss some time, including all four preseason games. The Dolphins released Garrard on September 4, 2012. The New York Jets announced that they had signed a contract with Garrard on March 11, 2013. Garrard announced his intention to retire on May 15, 2013 as consistent knee swelling impaired his ability to play. The Jets placed Garrard on the reserve/retired list on May 30, 2013. After resting his knee, Garrard decided to make a comeback and the Jets agreed to re-sign Garrard on October 10, 2013. He was placed on the exempt list for two weeks. He was activated on October 21, 2013. Garrard proposed to his wife Mary Knox before a 2002 Jaguars preseason game; the proposal was broadcast on the stadium's JumboTron. The couple was married in February 2004 and have three children. Garrard suffers from Crohn's disease and has appeared in television commercials regarding treating the illness. He has spoken to children at the Painted Turtle Camp, a camp for children with disorders about living with Crohn's disease. Garrard has also appeared in a Zaxby's commercial. Garrard has also been the spokesman for 121 Financial Credit Union (formerly Florida Telco Credit Union) since 2007. ↑ "Join the Team – Press Room – Press Releases". Jointheteam.com. Retrieved 2012-08-20. ↑ Archived August 14, 2007, at the Wayback Machine. ↑ "Miami (Fla.) vs. East Carolina". USA Today. September 25, 1999. Retrieved May 1, 2010. ↑ "Associated Press Weekly Tracking College Football Poll". CNN. January 7, 2000. Retrieved May 1, 2010. ↑ "Texas Christian vs. East Carolina". USA Today. December 22, 1999. Retrieved May 1, 2010. ↑ "CNNSI.com". CNN. Retrieved May 1, 2010. ↑ Taylor, Grant (2001-12-19). "Leftwich Leads Herd Back From 30– Point Deficit for 2001 GMAC Bowl Win". Marshall University News. Retrieved 2007-06-17. ↑ "Layout 1" (PDF). Retrieved 2012-08-20. ↑ "Official 2004 NCAA Football Division 1-A and Division 1-AA Records" (PDF). NCAA. p. 588. Archived from the original (PDF) on 2007-09-30. Retrieved 2007-06-17. ↑ CCFA.org: garrard Archived February 6, 2012, at the Wayback Machine. ↑ http://www.sportsnetwork.com/merge/tsnform.aspx?c=globe&page=nfl/scores/final/boxscore.aspx?GAMEID=1780 Archived February 24, 2006, at the Wayback Machine. ↑ "ESPN – Leftwich hurt; Jaguars to start Garrard on Sunday – NFL". Sports.espn.go.com. 2006-10-27. Retrieved 2012-08-20. ↑ http://sports.chron.com/merge/tsnform.aspx?c=chron&page=nfl/scores/final/boxscoreip.aspx?GAMEID=1922 Archived July 25, 2014, at the Wayback Machine. ↑ "ESPN – Garrard to be starting QB; Jags to trade or release Leftwich – NFL". Sports.espn.go.com. 2007-09-01. Retrieved 2012-08-20. ↑ Ketchman, Vic (2007-08-31). "His time has come". Jacksonville Jaguars. Retrieved 2007-09-01. ↑ "David Garrard Stats - Miami Dolphins - ESPN". Espn.go.com. 1978-02-14. Retrieved 2012-08-20. ↑ Jay Glazer (September 6, 2011). "Jaguars cut quarterback Garrard". msn.foxsports.com. Retrieved September 6, 2011. ↑ "Dolphins meet with free-agent QBs Delhomme, Garrard - NFL News | FOX Sports on MSN". Msn.foxsports.com. 2011-10-05. Retrieved 2012-08-20. ↑ "David Garrard needs surgery for herniated disc - NFL News | FOX Sports on MSN". Msn.foxsports.com. 2011-10-18. Retrieved 2012-08-20. ↑ Miller, Mark J. "Texans also put in a call to QB David Garrard - Scoop Du Jour - NFL Blog - Yahoo! Sports". Sports.yahoo.com. Retrieved 2012-08-20. ↑ "Miami Dolphins QB David Garrard has knee surgery, out 2-4 weeks - ESPN". Espn.go.com. 2012-08-11. Retrieved 2012-08-20. ↑ The Associated Press (2012-09-04). "Dolphins release veteran quarterback David Garrard - Yahoo! Sports". Sports.yahoo.com. Retrieved 2012-09-30. ↑ Orr, Conor (11 March 2013). "Jets sign veteran QB David Garrard". The Star-Ledger. Archived from the original on 11 March 2013. Retrieved 11 March 2013. ↑ Orr, Conor (15 May 2013). "David Garrard tells Jets teammates he's leaving due to knee issues". The Star-Ledger. Archived from the original on 15 May 2013. Retrieved 15 May 2013. ↑ Jets Media Relations Department (30 May 2013). "Obomanu Signed, Garrard to Reserve/Retired". New York Jets. Archived from the original on 30 May 2013. Retrieved 30 May 2013. ↑ Allen, Eric (10 October 2013). "David Garrard Returns, Placed on Exempt List". New York Jets. Archived from the original on 11 October 2013. Retrieved 11 October 2013. ↑ Allen, Eric (21 October 2013). "David Garrard Activated, Brady Quinn Released". New York Jets. Archived from the original on 21 October 2013. Retrieved 21 October 2013. ↑ "David Garrard Stats". ESPN Internet Ventures. Retrieved 2 April 2014. ↑ "David Garrard, Jaguars Quarterback is Beating Crohn's". Ibdcrohns.about.com. 2011-10-23. Retrieved 2012-08-20. Wikimedia Commons has media related to David Garrard.